Soundcloud users don’t have the ability to collaborate online and DJ on their their tracks in real-time. I mainly helped the team during brainstormed, creating mindmaps, crafting user interview questions, facilitate and perform user interviews, make wireframes in Sketch, perform competitve and comparative analysis, create the sitemap, and, create an MVP prototype in InVision. Desktop Website & Mobile App. Trello, Omnigraffle, Invision, Sketch 3, Sticky notes, Google Forms, Google Sheets and Google Docs. Me, Lana Dai and Krista Feierabend. We designed a feature that allows the DJ role to create a collaborative party playlist and invite participants to collaborate online. DJs will be able to set preferences as to the number of tracks a participant can add, reject duplicate tracks. Participants can like tracks and the number of likes will be displayed. Both roles will have access to the same search functionality and be able to add tracks to the same playlist from anywhere in Soundcloud. We followed the above process for our project which is mainly based on the double diamond method of starting out with the discovering phase, then narrowing down what problem we’ll be focusing on solving in the define stage, then using an open ended approach to look for possible solutions and finally narrowing down on what we will be delivering in the current project cycle depending on time, budget and other factors. We created a screener survey to qualify potential participants. We were looking for individuals who are familiar with music streaming services, making playlists online and possibly have some sort of experience as a DJ. We started off creating a mind map to organize our ideas around what we needed to cover in the interviews to validate our ideas and problem statement and then came up with the questions. Me and Lana performing user interviews. I was asking the interview questions while Lana took the notes. From our survey findings, we selected 13 people to conduct in depth interviews with. We asked them what DJing meant to them and how the made their playlists. We also asked, what their criteria was when they selected tracks for playlists to learn the motivations, behaviors, pains and pleasures. Most of the individuals defined a DJ as “someone who live mixes music into a continuous experience” and most of the people who create playlists for personal needs such as working, driving and exercising. They were also not very happy with SoundCloud because of the harsher implementation of copyright policies, including the deletion of music. The research showed us that there were self reported DJs and people who made playlists. The DJs were more seriously involved and needed to consider the flow, BPMs, transitions and sequence of tracks in a set whereas the ones who made the playlists were more concerned with mood and flow around activities such as driving, working out, etc. The DJs primarily used their laptop whereas the one who made playlists used both their laptop and mobile device. We analyzed 10 competitors that provide streaming services. The collaborative playlist feature is only available on Spotify’s desktop client and 90% of the people we interviewed didn’t know about this. 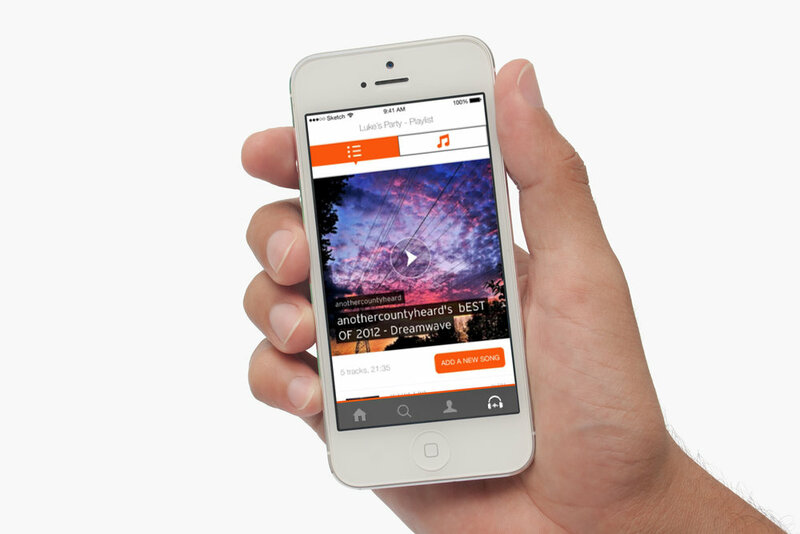 We saw an area of opportunity here which could help us increase usage of the Soundcloud app for the current users via this feature and also attract new users to Soundcloud. That being one of the main business goals (apart from improving paid membership) and users wanting to collaborate playlists online — this was a win-win. We compared user flows with different apps which were not direct competitors but supported the collaborative playlist feature to learn about the best practices being followed. From our research findings, we made two distinct personas. Luke, the semi professional DJ and Brendan, the Playlist Pro. Based on our personas we came up with the below features. • Collaborative playlist feature as a way to make playlists with friend’s, discover new music and contribute to playlists. • Different roles to differentiate between a DJ who’s in control (moderator) vs. an invited participant (participant). • Integrating existing search (predictive search, find from likes, find from playlists) into our new feature (MVP). From this, we determined what our Must Have’s, Should Have’s, Could Have’s and Won’t Have’s were. For our MVP, we focused on the Must Have’s and included some of the Should Have’s. We determined that our MVP will be a feature that enables the DJ to create a collaborative party playlist and invited participants for collaboration. They will be able to set preferences like the number of tracks a participant can add, not allow duplicate tracks. Participants can like tracks and the number of like will be displayed. The search functionality will remain the same for both roles so that they can add new tracks to the playlist. 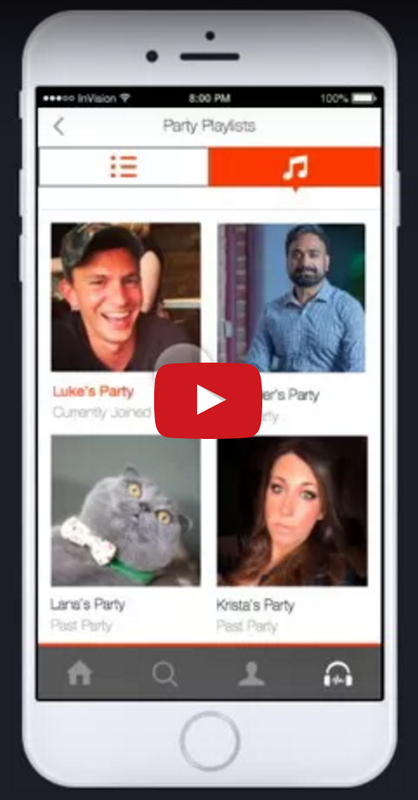 Users will also have to view other party playlists created in the past. To help us map out the pages that we need, we created user flows. There were also essential in keeping all the team members on the same page. We used the design studio method of sketching to ideate and pitch our ideas. We made sure our design adhered to Nielson Norman’s 10 Usability Heuristics. We made sure we stuck to SoundCloud’s current design standards as we were introducing a new feature on SoundCloud’s existing platform and not creating a new product. Doing sitemaps for this project was a bit different. Usually we make them to get a holistic idea of where everything is (as a part of content inventory) but in this case it not only helped us in content inventory but also helped us to know exactly where our new feature will go (marked in orange below). This was an integration so we made sure that it fell into the right hierarchy making it easier for the developers to add this in. For our feature, we created a user journey and scenario to show how Luke and Brendan would use it. 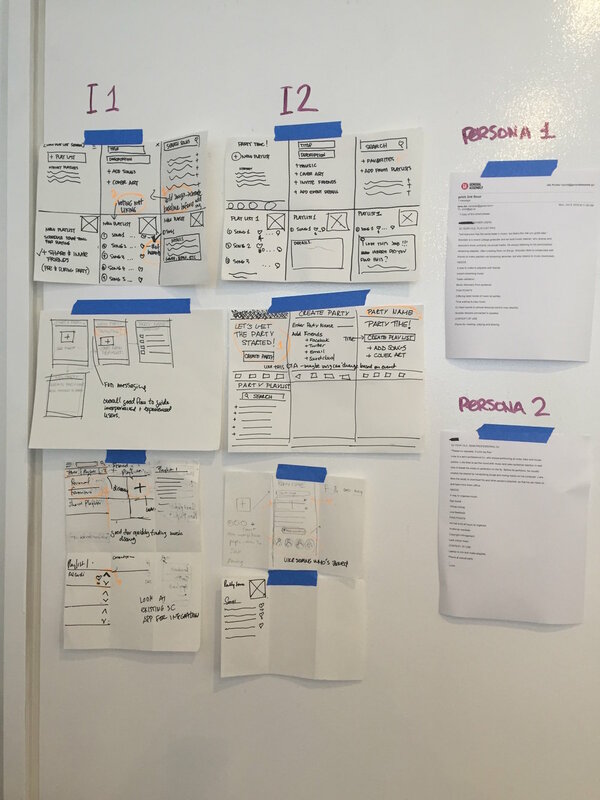 Within each step, we indicated the design heuristics, plus the pains and needs of our personas. The responsive mobile website directed the users to download the app so we made our final prototype on mobile. Since the creation of the playlist was not a feature used while collaborating (just the initiation), we made a medium fidelity wireframe for showing the process. We would create a high fidelity one as a part of our next steps.